Thanks to its expertise as an O.E. spare parts manufacturer, Valeo has always provided its customers with a wide range of high-quality products and performing equipment for garages. In addition, Valeo Service continues to strongly reinforce its portfolio of products as well as supply a panel of technical services which helps clients fully benefit through the use of these levers of growth. 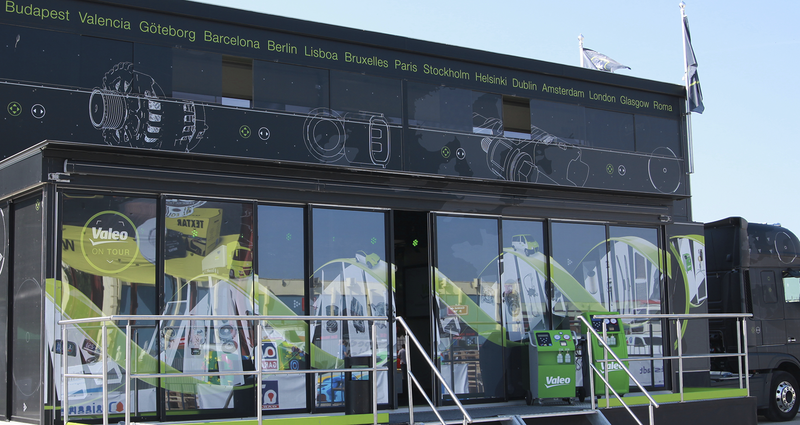 The idea to build a moving show-room to better visualize the variety of our products and to bring it as close as possible to our clients – during exhibitions, clients events, Tech’days – naturally came to our mind… Valeo on Tour program was born! This truck is fully adaptable with an expandable surface of 45 m² to 100 m² on ground floor, and has a 32 m² conference room on the first floor. The means of presentation for products have been chosen to be as didactic as possible, such as demo-car, video walls, garage equipment and product mock-ups. Valeo on Tour is a new way to highlight the Valeo Service “We care for you” strategy.